Have you ever found yourself with the refrigerator door open thinking about what breakfast is going to be ? The kids are complaining that they are starving and you’d rather not have cereal or toast for the fourth time this week. So, what to do ? 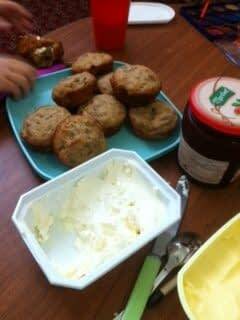 Make zucchini muffins or quick bread together. 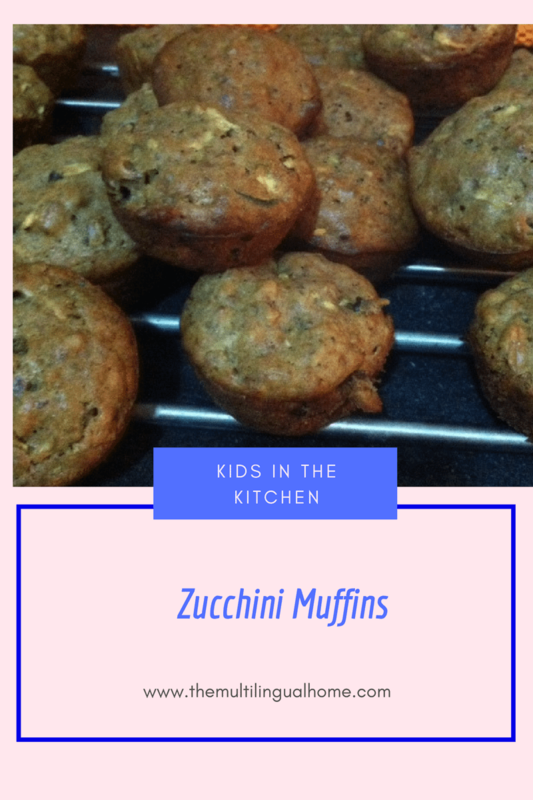 These zucchini muffins are quick to make and you can make a lot in advance to stock the freezer with so no more questions about breakfast. While, there are many recipes online, I usually stick to the one from my family’s cookbook that my mom put together when I was younger. 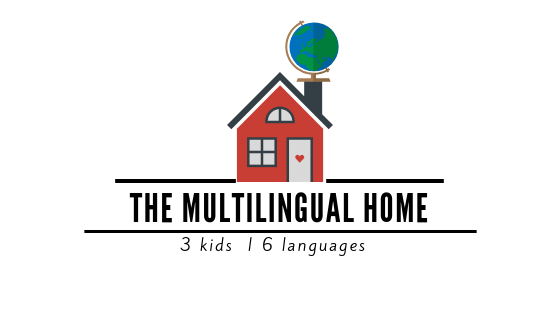 Every month, the kids and I make these muffins together often tripling the recipe, it makes measuring and clean up more fun. I think about how I am passing on family traditions to them even though we may be an ocean away from extended family and it’s my hope that they will pass it on to their own family. We have started using whole wheat flour and oatmeal more in our home to make healthy snacks and baked goods for the kids. No matter how much I change ingredients, they somehow always tastes like Grandma’s. It always seems that everything tastes better at Grandma’s. It also seems that kids eat more at Grandma’s, somehow they miracoulously love broccoli or green beans that they say at home “I’m not eating that”. Preheat oven to 350 F°or 170 C°. Use 2 greased 9″ x 5″ loaf pans or 2 – 6 muffin pans. Mix zucchini, oil and eggs in a elcetric blender or mix well with a wooden spoon. The mixture does not have to be smooth. Mix together flour, sugar, cinnamon, soda, salt and baking powder in a spearate bowl. Stir in zucchnini mixture, add nuts and vanilla. Stir thoroughly, but do not overbeat. May use low speed mixer. Bake in preheated oven. Be sure pans are not touching. Bake for one hour or until food tester comes out clean when inserted in center. Cool in pans about 8 minutes and then turn out loaves or muffins on wire rack and finish cooling. Enjoy wth some butter and jelly or cream cheese or just plain. Check out some other family recipes here. 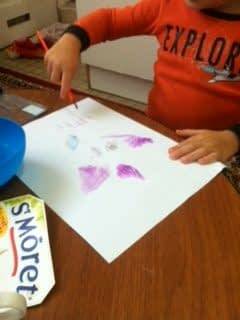 What have you made recently with your kids or grandkids ? Pregnant and Giving Birth in France : What’s in my Hospital Suitcase ?